News > 2016 > National Investment Banking Competition: HEC Montréal delegation takes 3rd place! National Investment Banking Competition: HEC Montréal delegation takes 3rd place! 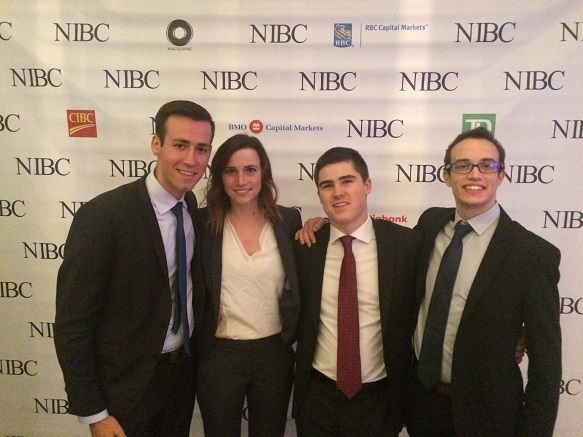 BBA students Louis Arsenault, Akram Bencherif, Lindsey Gresham and Jérôme Tardif, all members of the HEC Montréal Student Investment Fund, took 3rd place in the National Investment Banking Competition (NIBC), held in Vancouver from March 23 to 24. This case competition for undergraduate, master’s and PhD students, launched in 2007, is one of the largest in North America. About 330 teams and over 1,400 students from more than 100 universities take part every year. Congratulations to all four students and their coach, Guest Professor Jacques Lemay (Finance)! Jérôme Tardif, Lindsey Gresham, Louis Arsenault and Akram Bencherif.